Who wants to pick up spent ammo after the fun is had? Now, even that can be fun with the 8" Mini Ammo Picker Upper! Compact design is ideal for tight spaces-- able to get a BIG job done in a small unit! Has new added feature of being able to pick up going in forwards or backwards motion! Spent ammo is captured in the "magic finger" design and then ejected into the collection basket. Once complete, just lift the lightweight basket and empty it! Clean up is done! 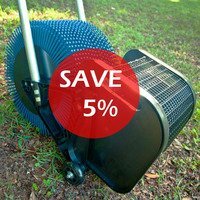 Works on concrete, carpet, dirt and up to 4" tall grass. 9mm, 10mm, 40, 45 Auto, 38 Special, 367 SIG, 308 (7.62mm), .223 (5.56mm) and many more. (Note: Ammo Picker Upper will not pick up .22 rimfire). We're proud to offer our Ammunition Picker Upper/ Brass Collectors for the best delivered price on the internet. If you have any questions, please call (855) 743-5537.